Beginners’ guide to Software Asset Management Module: Getting Started. Usually, when someone visits the “Software accounting” tab for the first time, he just doesn’t know from where to start. Well, software and license accounting in networks has never been too easy. We decided to release a series of blog posts for those who have just begun to use this module or avoided using it for some reason. We are going to advise you from where to start and what kind of information may prove to be most useful. First, you need to pay attention to the menu in the upper left corner. This is where you select the section that is displayed on the screen. “Software” tab – to view and manage software information. “Licenses” tab – to view and manage licenses and keys. 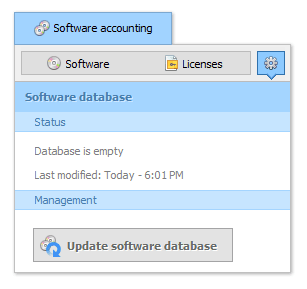 “Manage database” tab (gears icon) – to create and update software database. We will start from the last point; it is only used if the database does not exist yet: you can manually update the database or import the database from an earlier version of Total Network Inventory. So, if the database hasn’t been created, click the “Update software database” button and let’s move on to the other tabs. The “Software” tab displays almost all the information at once. Therefore, it is important to know how to filter this information and we are going to describe it in our next blog post.